A city academy has opened in Leicester after more than a year of construction. The £20m Church of England's Samworth Enterprise Academy is funded by local businesses, the Church of England and the government. The school will educate children aged from three to 16 years, including some from other religions. The initial enrolment is 500 pupils, but Principal Pat Dubas said they expect the school to have more than 1,000 when it reaches capacity. 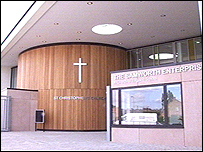 Located on the Saffron Lane Estate, the school is jointly sponsored by the Church of England and local businessman David Samworth and was given the green light by the government in early 2006. The academy will serve the Eyres Monsell and Saffron areas of the city.